In spite of my lack of artistic talent, I do admire people who are gifted that way and usually enjoy seeing their work on display. There are exceptions, though. I don’t like those goofy looking pictures with wild, swirly shapes and weird colors, and maybe a random eyeball or two thrown in here or there. Some kinds of artistic expression are so bizarre that they kick in an involuntary gag reflex. You know, like when you accidentally stick your toothbrush down your throat – or you happen to see a dog that was just licking you in the face who’s now enjoying a bite of something he already ate yesterday. In any case, I recall spending a couple of hours one day watching a potter at work and found the experience thoroughly fascinating. I visited the establishment because I had been reading the Jeremiah 18:1-10 passage where God sent Jeremiah down to the potter’s house to observe him at work, and I thought it might be intriguing to do that myself. It wasn’t like I was on some special, prophetic mission from God, I just figured that if He had sent Jeremiah to watch the process, there must be some kind of lesson in it worth learning. The potter was a busy little guy, always moving and peering at his work—and squinting. I wondered if I would be more artistic if I peered at stuff and squinted more, but I never experimented with the tactic. In any case, the potter never made an announcement about what he was about to do, and he worked in silence—no comments, explanations, or descriptions. He’d just grab a nondescript hunk of clay off the shelf, beat on it for a while to soften it up, plop it onto the wheel, and then begin to work. It was impossible to tell at first what kind of vessel he was making. There was no picture illustrating what the finished product would look like, and whatever design there might have been, existed in his head alone and remained invisible to the rest of us through most of the process. All we could do was wait and watch as the piece developed. As the wheel turned and he began to work, the design in his head that we could not see found its way down to his hands and feet. 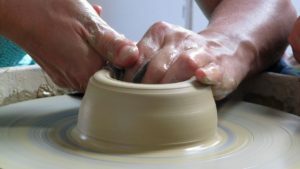 As he pumped to keep the wheel turning, his hands deftly, carefully pushed and pulled against the clay, dipping them in water periodically to keep the piece moist. He didn’t get hurried and never seemed to force anything. He patiently urged the clay a little at a time, bending and shaping it, removing excess, gradually thinning the walls until a vessel began to emerge. It was unclear through most of the early stages what the end product would be, but as he continued to shape the material, it became clear that he was making a small pitcher. He rolled and manipulated other pieces of clay and they became handles and decorative scrollwork for the sides. It was almost like some kind of magic. Raw material that a little while ago had no pragmatic purpose, no claim to beauty, even worthless from a market perspective, had become a vessel of beauty, purpose, and value. A hunk of moist dirt had been transformed before my eyes into something desirable and functional. The potter had given a wordless demonstration of the genius of God in His work with human beings. That brings me to a burden we all have shared since the news broke that seventeen innocent people, mostly children, had their lives ripped away earlier this week in a Parkland, Florida school. All of us felt again that awful “blow-to-the-heart” as the pictures and stories poured in. We struggled to get our heads around the fact that another deranged or demonic (or both) killer had taken his lust for innocent blood into yet another school. Then the predictable aftermath parade began. Following the initial shock came the inevitable waves of public posturing, politicizing, and psychological probing as the quest to “understand” unfolded. Every professional group imaginable has already begun its own effort to track the development of the pathology that led to another cold and calculating slaughter of peaceful and defenseless people. Everything about this young murderer’s life will be dissected and scrutinized in meticulous detail in the weeks to come. We will hear about his mental status, family background, personal idiosyncrasies and preferences, and questionable social history. Conclusions will be drawn, theories will be offered, legislation will be demanded, some kind of justice will be sought, all in an effort to diminish our fears and avoid asking, “Whose child will be next?” But one profoundly relevant issue will be ignored—again. The violence, moral degradation, and ethical chaos currently enveloping America should surprise no one. Maybe this time, somebody will suggest that we examine whose hands are on the precious clay we send out to our public schools every day, what pattern is guiding their work, and what kind of vessel are they really making? No one on mainstream news outlets will be heard talking about the psychological and behavioral impact of exposure to 12 to 14 years of “education” that not only fails to offer a reliable, authoritative basis for sound moral judgment but vociferously denies that such a basis exists. 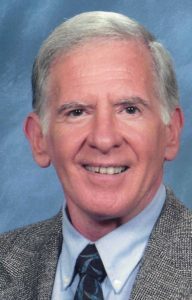 Nobody will point out that there might be consequences to a public educational system in America that actively opposes anything remotely suggesting a reference to God, or the Bible, or anything that sounds like Christianity, or that smacks of moral accountability. Our children must be “protected” from such dangerous influences as the Ten Commandments and divine admonitions to love one another. Meanwhile, every kind of moral perversion imaginable must be taught, defended, and even promoted in the interest of a “well-rounded” education. It shouldn’t be all that shocking that decades of that kind of powerful academic influence has us struggling to find ways to protect our children from one another.